"To leave my home is always an adventure and in Havana something happens every day, things the world doesn't know about and things we photographers see because we always observe much more." 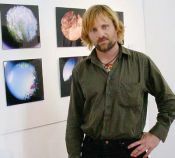 An interview with the North American actor and photographer Viggo Mortensen in connection with the opening of the exhibition of his work at the Fototeca de Cuba. However, for this artist 'to leave my home is always an adventure and in Havana something happens every day, things the world doesn't know about and things we photographers see because we always observe much more.' His stay on the Island is thanks to the Fototeca de Cuba, a gallery that is showing his exhibition called 'Un hueco en el sol,' an abstract study of spaces and objects found in different places around the world where he has traveled in search of encounters with other cultures. 'I always wanted to travel to Cuba, like many people in the United States, but it is difficult. Now I (alone) am allowed a visit of one week, but I would like to return for a month during the Biennial Celebration. Then I could study the landscapes, the streets, the walls and people, and go looking for those details that allow you to show that not everything has been said and done in art, that this is not the end or the death, that there are still things (waiting) to be discovered." And some have discovered that you are a well-known Hollywood actor who portrayed Aragorn in the first two films of The Lord of the Rings and in the third film which is still shooting? "Some. It is something that's inevitable and therefore I accept it. The movies are a result of my studies of acting (Dramalogue Critics Prize for his performance in the play Bent). I tried to do it and it has gone well for me. I have made several films (Crimson Tide, The Indian Runner, Psycho, Carlito's Way, Portrait of a Lady) between good and bad, but it is only after working in Peter Jackson's film version of Tolkien's novel that they know me everywhere in the world." The artist recognizes that this has influenced the rest of his work, and for that reason he preferred that while in Cuba he was only seen as the photographer he also is. "In Denmark, where I have roots, they rated me very highly after the first film, nevertheless I have now published a volume of poems and a certain critic attacked me saying that I should dedicate myself to acting. However I write, I paint, I've taken photographs since high school, long before becoming an actor and I have published a book of these works before filming The Lord of the Rings."